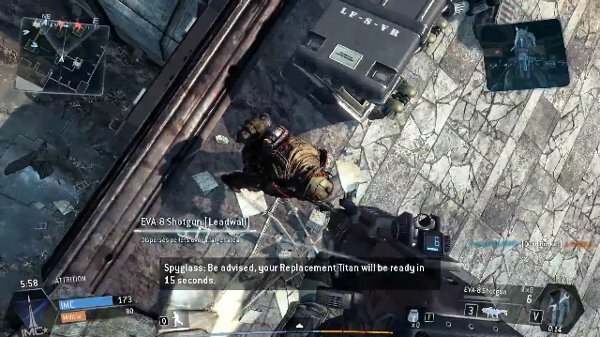 In Titanfall, Pilots can hop on - or "rodeo" - enemy Titans to cause more damage. What happens when a Pilot rodeos another Pilot, though? The video below shows one player accidentally latching onto the back of an enemy when they collided mid-air. The player was then pulled around like a birthday balloon by his oblivious foe. If you're prone to motion sickness, this isn't the video for you. Being a pragmatist, our hero saw the bug as an opportunity to get a kill. Once the enemy Pilot stopped leaping around the map, the player finished him off with a few pistol rounds. Easy peasy. That's not the end of the story, though. After the enemy collapsed to the floor, the player realized he was still tethered to the corpse. His frantic jumpkicks at the air in frustration were probably the highlight of the video. Before he can log off, however, the enemy respawns...with the player on his back again. He gets another easy kill because hey, if your game's going to get sidetracked with a glitch, you might as well get some XP out of it. On the next respawn, the enemy is inside of a building. Instead of being teleported into the building, the player rodeoing him ends up on the roof. He's then dragged back and forth for a minute while the enemy Pilot navigates the building's interior. He's finally able to detach himself from his opponent by summoning a Titan and climbing inside. Other players on the Titanfall subreddit reported encountering the same issue. It seems to be a rare issue, though. In the case of this video, it took a lucky mid-air collision. The PC version was shown here but it's possible that the bug could appear on Xbox One as well. Not all of the glitches in the game are so innocent as this one, though. There have been reports of playing using aimbot and other hacks to get an unfair advantage. Respawn says that they'll be punishing these cheaters soon, though. Titanfall debuted on PC and Xbox One earlier this week. Today is launch day for the game in the UK and New Zealand. Before you buy the shooter, be sure to check out our review. I've personally had a very smooth experience with the game thus far.